3706 place | Vector illustration in rank M-rank: Simple Set of Survey Related Vector Line Icons. Contains such Icons as Emotional Opinion, Rating, Checklist and more.\nEditable Stroke. 48x48 Pixel Perfect. 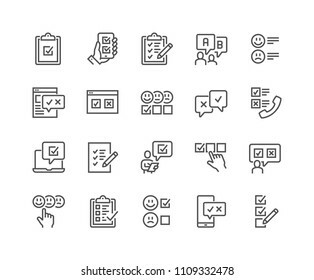 Simple Set of Survey Related Vector Line Icons. Contains such Icons as Emotional Opinion, Rating, Checklist and more.\nEditable Stroke. 48x48 Pixel Perfect.